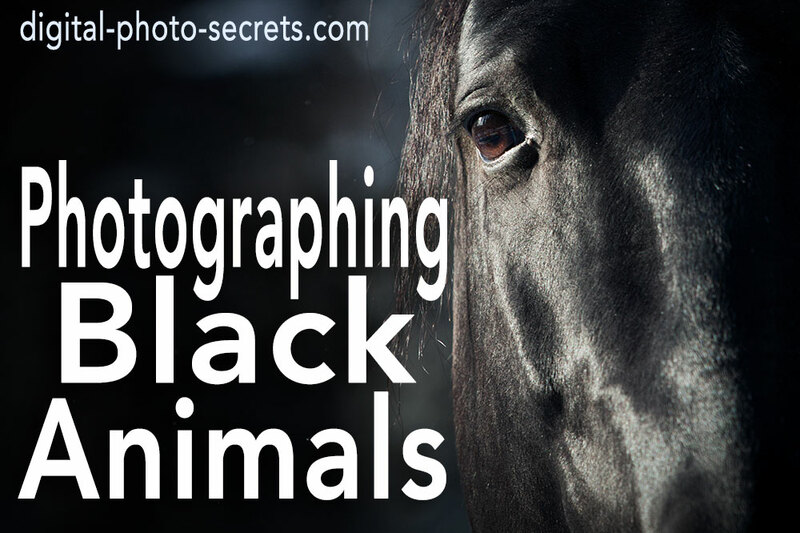 Animal photography always presents challenges, depending on the animal and the situation. Wild animals, of course, are elusive, which means you often need a telephoto lens and a certain amount of patience to photograph them. Pets are easier, but making a playful dog sit still long enough for a photo or a curious cat resist the temptation to put her nose in the lens are challenges you might encounter even with the most photogenic of pets. No what about reptiles? They are neither friendly nor playful, and yet they can make for some incredibly interesting and engaging subjects. 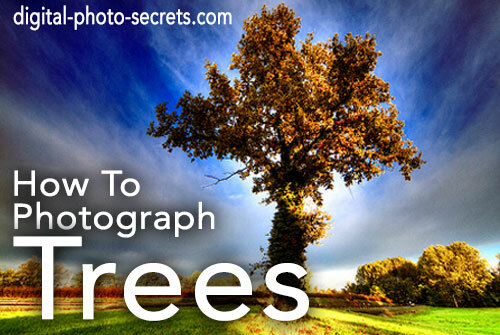 Read on for some tips on how to photograph them. Most reptiles aren't dangerous. 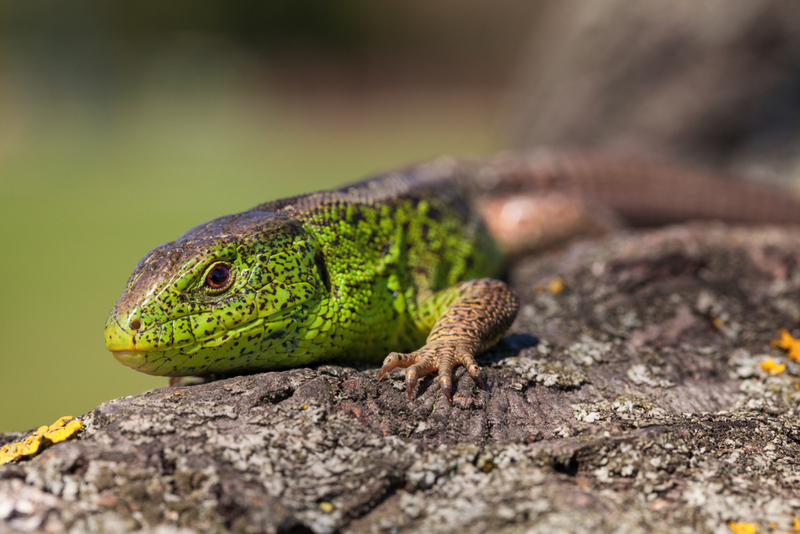 However, depending on where you live, certain snakes and even some lizards can be an exception, and no matter how cautious you may be you still run the risk of injury. 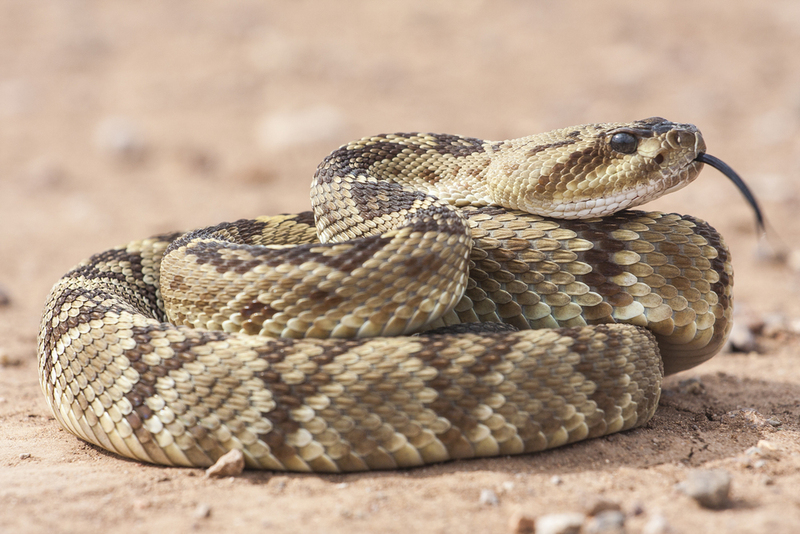 Rattlesnakes, for example, are quite common all over the southern and western United States, and a bite from a rattlesnake can be serious, even deadly. What's more, certain snakes masquerade as rattlesnakes, and for the untrained eye it may not be easy to tell the difference. So if you live in an area where a venomous snake of any kind also lives, you need to take steps to protect yourself. As far as I'm concerned, that means you will avoid both the encounter as well as the photographic opportunity, unless you are with someone who is knowledgeable about your subject and can advise you about its habits, and, more importantly, its striking distance. Snakes aren't generally aggressive in that they won't usually attack without provocation, but if they feel threatened they're going to strike. You may think you are at a safe distance, but you may not be. And a camera on a tripod, a human crouching down to get a better look—these things are all going to be interpreted as threats by your subject. Unless you are very used to being around venomous snakes and you know a lot about their behavior, photographing one is not something you should attempt, unless there's a nice thick piece of glass between you and it. 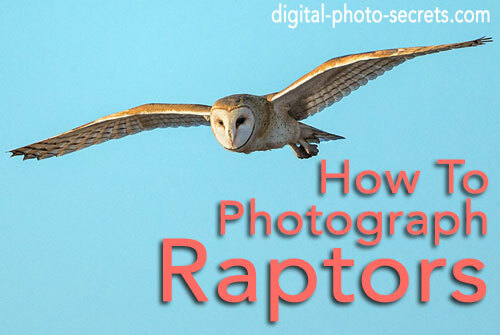 Your approach to photographing reptiles and amphibians is going to depend a lot on the species of reptile or amphibian. 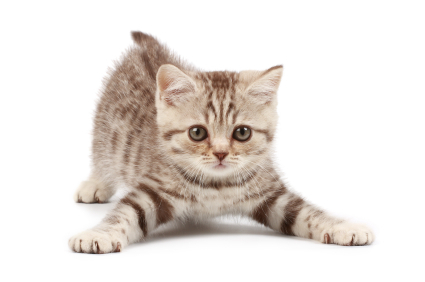 Reptiles are cold-blooded animals, which means that they move faster when it's hot, and slower when it's cold. Sometimes, the best time to photograph a reptile is early in the morning in the spring, when it's still very chilly but the animals have come out of hibernation in anticipation of warmer days. 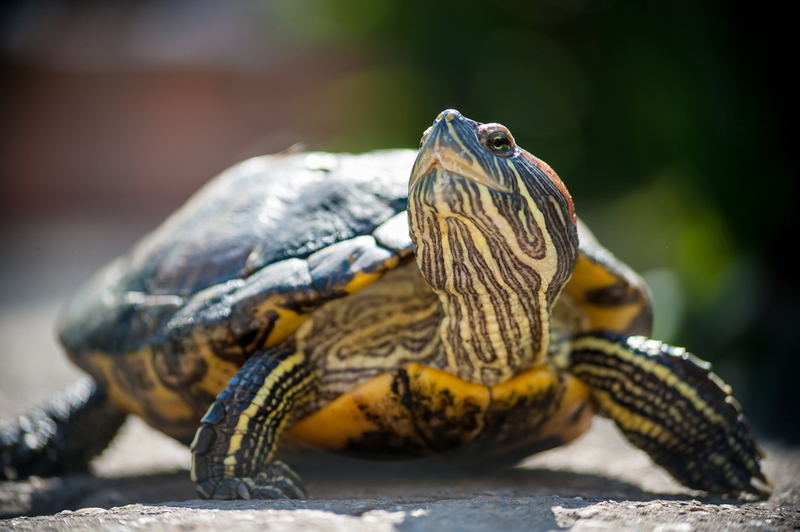 Some species don't ever really move fast—animals that spend a lot of time basking in the sun such as turtles and some species of lizard are good examples. Other reptiles such as common small lizards move very quickly and are wary of people, which makes them infinitely more difficult to photograph. Your first challenge is simply finding these animals. If you don't plan to leave your local area, start by making sure you know what types of reptiles are native to your region, and what sorts of habitats they can be found in. Then go out in the morning when they're less likely to be super active but you still have a chance of finding them, and start turning over rocks or seeking out seeking your subjects out in their preferred habitats. Remember to be careful – just because you're not looking for a rattlesnake doesn't mean you won't encounter one. If you are in a place that has venomous snakes, wear a thick pair of gloves and be extra cautious when you're turning over those rocks. 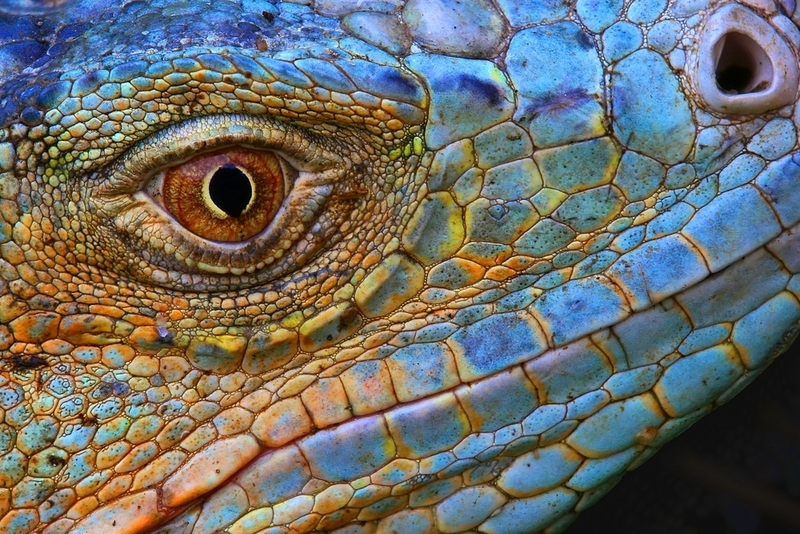 Like children, you will capture a much more compelling photograph of a reptile if you look it in the eye. This means it getting down to its level, at which often also means getting a little bit dirty. Don't worry if you have to lay on your stomach in the mud — it will be worth it. 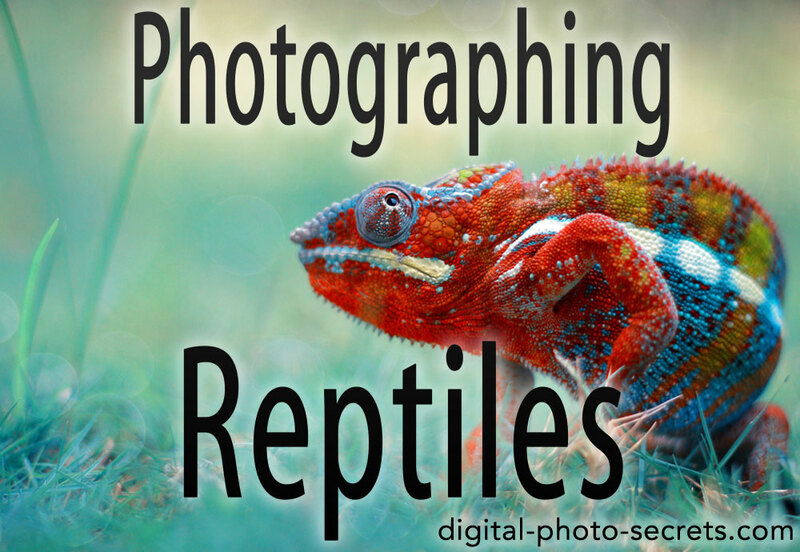 Photographing a reptile from up above is not going to give your viewer the same level of connection with that animal as she will get if you photograph your subject from eye level. Remember that in any portrait, even that of a nonhuman subject, the eye should be the sharpest part of the image. 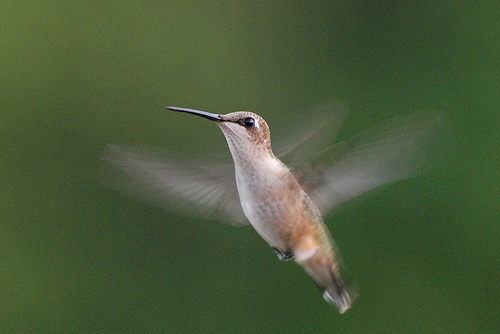 Use single point autofocus to place your focus point directly over your subject's eye. And try to get a catchlight in the eye if it all possible. 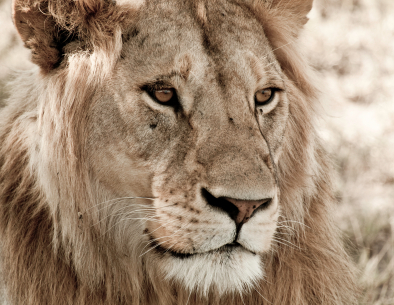 Positioning the sun so that it is behind you and reflecting in the animal's eye is a good way to get that catchlight. You can also use flash — this can not only create a catchlight but is also especially helpful if you're shooting in the brighter part of the day and you need to fill in some shadows. 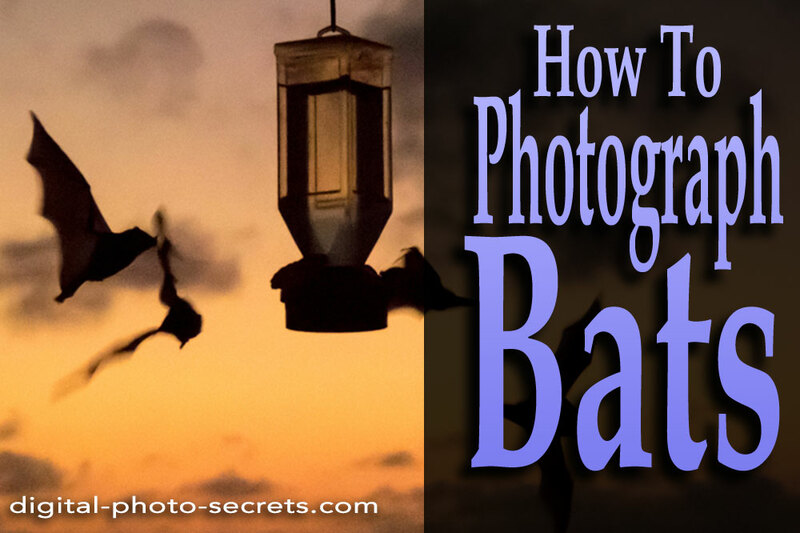 You may need to adjust your flash's power so that it doesn't create an image that looks artificially lit. 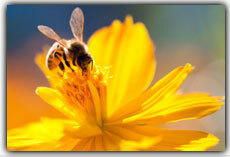 The rule of thirds iworks great with reptiles—try to place the eye on one of the four rule of thirds intersections. An exception is if you are shooting the animal from straight on and you have a symmetrical image—in that case, centering your subject will help create an appealing photograph. Depending on the size of your subject, you may have difficulty getting broader depth of field from foreground to background. When you're shooting a small subject you may need a macro lens, and generally speaking the closer you get to a small subject the less depth of field you're going to end up with, even when you're shooting at narrow apertures. Don't obsess too much over depth of field—unless your subject is very lethargic you won't even really be able to use focus stacking to get broad depth of field in a very small subject. Instead, embrace the blur. Make sure you have a sharp eye, and that limited depth of field is going to be a lot more acceptable. 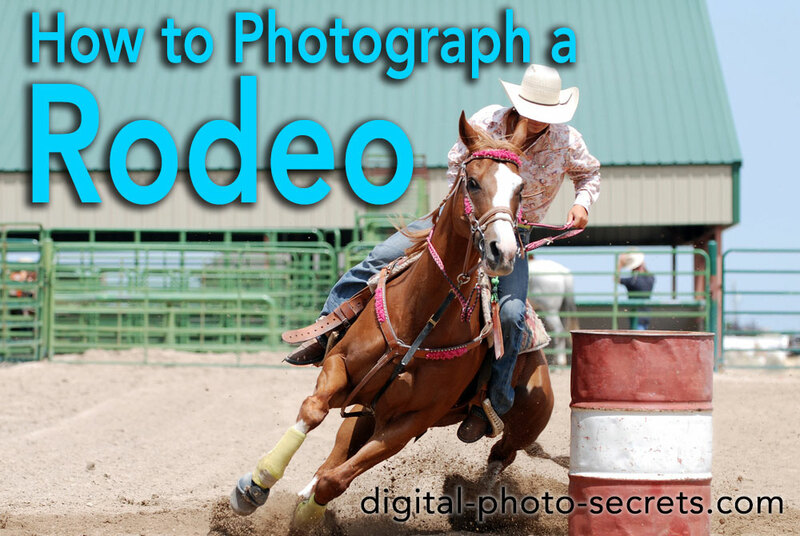 If you want to capture more detail, orient your subject so it's parallel to your lens rather than at an angle. For larger subjects, you may have an easier time getting a broader depth of field, so shoot with a narrow aperture whenever you can. But remember that your focal point should always be the eye. One of the wonderful things about reptiles is that they have amazing texture and pattern in their skin. You should always seek to capture this texture and pattern with as much clarity as possible—this might even be a good argument for turning a reptile photograph into a black and white. Black and white images of texture tend to be more compelling because the viewer isn't distracted by color (of course a subject that has spectacular color would be ill-served in a black and white image, so use your judgment). In order to effectively capture texture you need good light. This is another argument for shooting early in the morning—not only will your subjects be more lethargic and easier to photograph but the light will be softer and more even, which will bring out that beautiful texture better then direct overhead light will. Filling the frame is always an effective technique, but don't be afraid to show a little bit of context as well. Sometimes a photograph is more meaningful if you show the animal in its natural environment rather than at high magnification. If you have some time and a willing subject, try doing both. 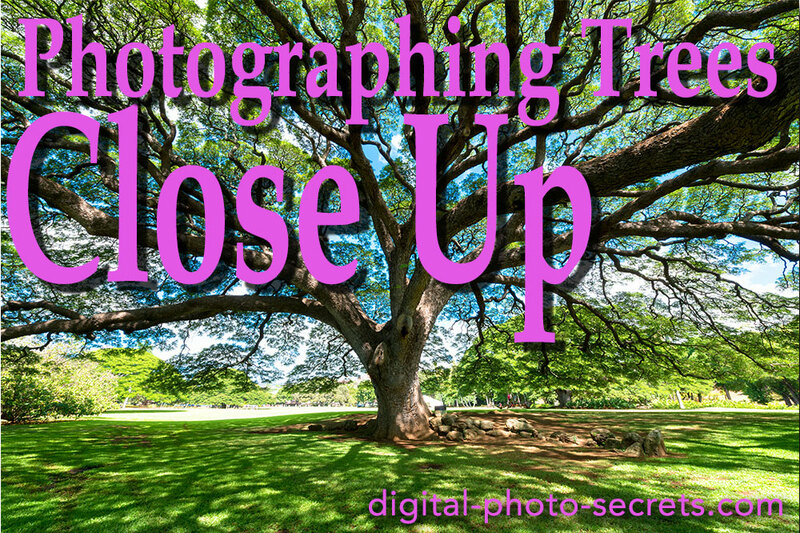 A few close-ups and a few zoomed-out images can help round out your photo shoot and give you a nice range of images to choose from. If you have some time, hang out and watch the behavior of your subject. This is where a little research can come in handy — if you know what your subject eats, where it lives and what its habits are you can be on the lookout for interesting things it might do. You're having some trouble finding reptiles in their natural environment or if the chances of encountering a venomous snake are just too high for your own personal comfort, you always have the option of visiting a pet store or a zoo and photographing reptiles behind glass. Of course there are some challenges to doing this — reptile houses in particular tend to be very poorly lit, which means you will need a camera with a high ISO, and a fast lens such as a 50mm prime. That fast lens will give you limited depth of field, so remember it's even more critical to capture a sharp eye if you're going to be shooting at wide apertures. 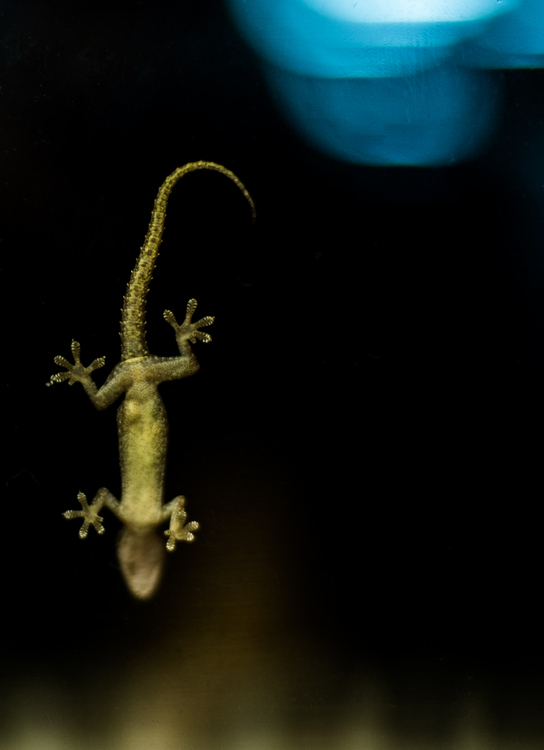 And the glass itself presents some unique challenges, too—the reflection of a child's face looking into a cage at an interesting reptile can make for a compelling photograph, but if your goal is to capture the detail of the animal you need to try to avoid reflections as much as possible. One way to do this is with a rubber lens hood — if you have one of these you can just place your lens directly up against the glass and that will cut out most of the reflections. Of course you also need to avoid spots or smudges on the glass, so you can bring along some glass wipes to quickly wipe down the surface if you need to. If the spots are on the inside, however they may present more of a problem. If there are spots on the inside they will usually be blurred out if you get very close to the glass, but nevertheless you should try to find the clearest part of the glass to shoot through in order to prevent any smudging or loss of detail that might happen because of dirty glass. Reptiles make for some interesting subjects, often just based on texture alone. And as a bonus, you can learn a lot about your local reptile population by spending a few days pursuing them. Just make sure you take precautions, keep your distance from any reptile (especially a snake) that you can't identify, move slowly so as not to alarm your subjects and have patience. Like any animals, reptiles are challenging but rest assured that your successful photos will be some of the most rewarding shots in your portfolio.